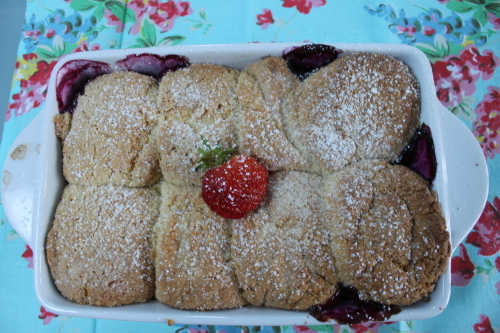 This recipe for blueberry, raspberry and strawberry cobbler is from Tamasin’s Kitchen Bible; one of Tamasin Day -Lewis’s excellent cookery books. 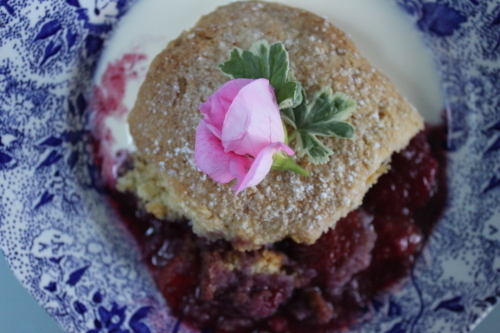 She describes cobbler as ‘a sort of pie with a scone-like crust’. I made it tonight to celebrate the start of the Bank Holiday weekend (in Ireland). It’s easy to make and it tastes delicious, so delicious that I ate two helpings! Heat the oven to 200ºC. 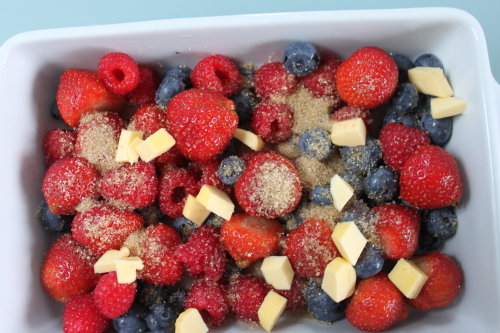 Put the fruit into a baking dish and scatter over the muscovado sugar and little knobs of butter. Rub the butter into the flour and baking powder in a large bowl (be careful not to over mix it) it should end up the texture of fine breadcrumbs (I used a food processor for this stage and then transferred the mix to a large bowl). Stir in all but a table-spoon of the caster sugar and quickly and lightly all the cream. Shape the dough (with a scone cutter) into little biscuits about 5cm in diameter and 1cm thick and place them on top of the fruit. Sprinkle the rest of the sugar over the top and bake for about forty minutes. Serve with double or clotted cream. Enjoy. Just made a cobbler myself last night. It was a Delia’s summer recipe made with gooseberries from the garden and sweetened with sugar and elder-flower cordial and served with her gooseberry ice cream. Yum.